In Hinduism, Goddess Lakshmi is the goddess of wealth, fortune, auspiciousness, fortune, power, luxury, beauty and fertility. Also known as Mahalakshmi, or Laxmi, she is the consort of Lord Vishnu. In Hindu religion, each deity also has a symbolic meaning. Thus the Wealth represented by Goddess Lakshmi is not limited to material wealth or money but also includes noble values, concentration power of the mind and the intellect, moral and ethical wealth which is needed to tread the path of realization. Goddess Lakshmi is depicted with four arms or two. She is draped in a red saree and is bedecked with gold ornaments. She is seated on a lotus or sometimes standing. She always holds a lotus in her hand and one hand is in blessing form. Goddess Lakshmi is mentioned in Shri Suktha in the Rig Veda, the oldest text. The popular legend associated with her origin is traced to the churning of the ocean of milk – Samudra Manthan. It is believed that Goddess Lakshmi came out during the churning of the ocean of milk by the gods (Devas) and the demons (Asuras) for obtaining the nectar (Amruth). There are very few temples exclusively dedicated to Goddess Lakshmi. Mostly she is enshrined as the consort of Lord Vishnu. Thus all popular Vishnu Temples are also Lakshmi Temples. Two of the important independent Mahalakshmi Temples are at Kolhapur and Mumbai. Some of the most important annual pujas and rituals dedicated to Goddess Lakshmi include Varamahalakshmi Vrata, Mahalakshmi Vrata, Navarati, Kojagari Lakshmi puja, Mahalakshmi Puja during Diwali and Manabasa Gurbar in Orissa. Eight forms of Lakshmi known as Ashta-Lakshmis is the most important manifestations of Mahalakshmi. There is no standard list for her eight manifestations and it varies from region to region. 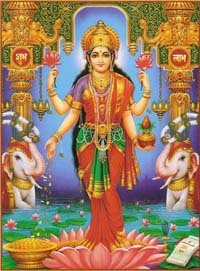 Lakshmi also incarnates in human form during the incarnation of Lord Vishnu – mostly as his consort. Shri is the sacred symbol of Lakshmi and it is written atop account books and in front of homes, shops and other business establishments. When Goddess Lakshmi is worshipped at home, she is visualized and prayed to as an independent deity and not as consort of Vishnu. She is worshipped as yantras, diagrams, and also as brass pot (kalash). The most popular representation of her at home is paintings or photos or idols. The most important part in Lakshmi Worship is cleanliness. Popular belief is that Goddess Lakshmi does not enter those houses that are kept unclean. Astha Lakshmi Stotram, Lakshmi Ashtakam, Lakshmi Astottara Stotram and Lakshmi Sahasranama Stotram.